Currently I am running Git bash inside IntelliJ Idea (http://blog.codeleak.pl/2014/02/git-bash-in-intellij-idea-13-on-windows.html). I would like to use cmder but I need to know if I can do the same, and if so, what command line arguments do I need to supply? $CMDER_LOCATION\cmder\vendor\conemu-maximus5\ConEmu.exe /Icon "$CMDER_LOCATION\cmder\icons\cmder.ico" /Title Cmder /LoadCfgFile "$CMDER_LOCATION\cmder\config\ConEmu.xml"
Holy moly that'd be awesome!!!! 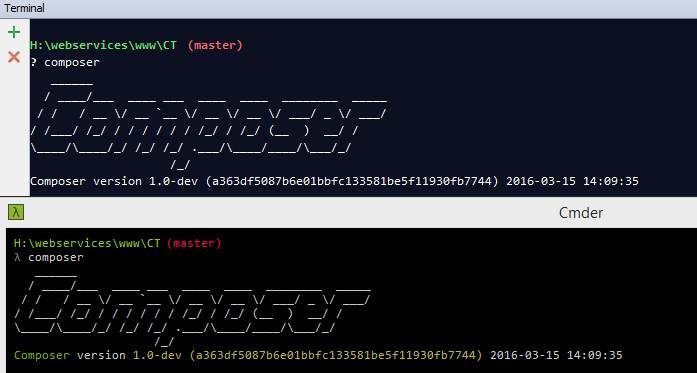 Set an environment variable called CMDER_ROOT to your root Cmder folder (in my case C:\Program Files (x86)\Cmder). It seems to be important that this does not have quotes around it because they mess with concatenation in the init script. 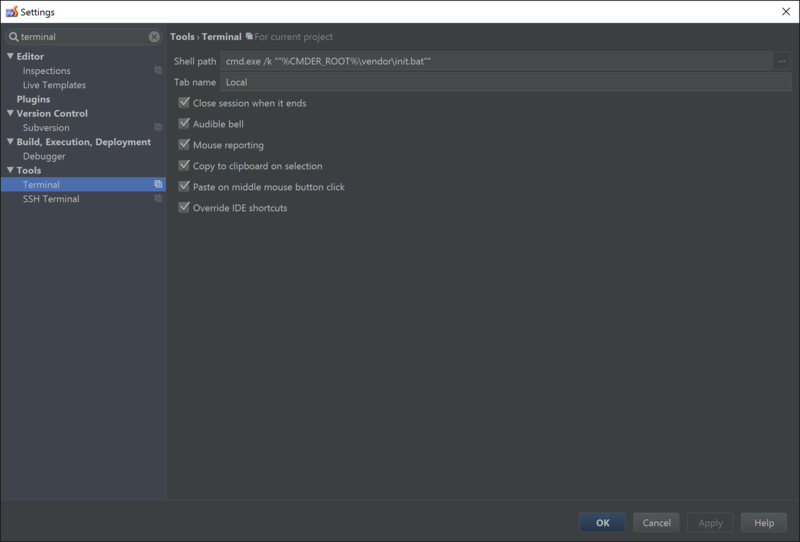 In your IntelliJ terminal settings, use cmd.exe /k ""%CMDER_ROOT%\vendor\init.bat"" as the Shell path. The double-double-quotes are intentional, as they counteract the missing double quotes in the environment variable. Unfortunately the lambda symbol is not supported in IntelliJ yet, but everything else seems to be working fine. @nikrolls technique worked for me as well (Thanks!). The only requirement was that I needed to restart IntelliJ for it to work correctly after adjusting the settings. Simply hitting "Apply" and "OK" was not enough. IntelliJ 15.0.2 displays the lambda symbol. What about opening mintty with git bash in Intellij? Can you specify the mintty task when doing this? I have opened git bash in intellij, but the lambda symbol still shows up as ? When I try @nikrolls suggestion, I get "The system cannot find the path specified." When I put %CMDER_ROOT% into a windows explorer address bar, it works. I put cmd.exe /k ""%CMDER_ROOT%\vendor\init.bat"" as my Shell path in PHPStorm. I start PHPStorm and get "The system cannot find the path specified." @martin-wiseweb Perhaps you forgot to restart ide. I had the same error in IntelliJ. It helped me. @nikrolls Thanks, man. It works. If I missing some configuration or misunderstood something, please correct me. @mdesign83 It isn't technically running cmder in IntelliJ, just the initialisation scripts that cmder uses. I'm having trouble getting the lambda icon to come up in IntelliJ. Was there any special config or some command flag that needs to be passed to make this available in IntelliJ 2016.1? @born2net I was getting the same issue, but resolved it by using the full cmder install opposed to the mini. would you try to add call command to call the init.bat to see if it works? 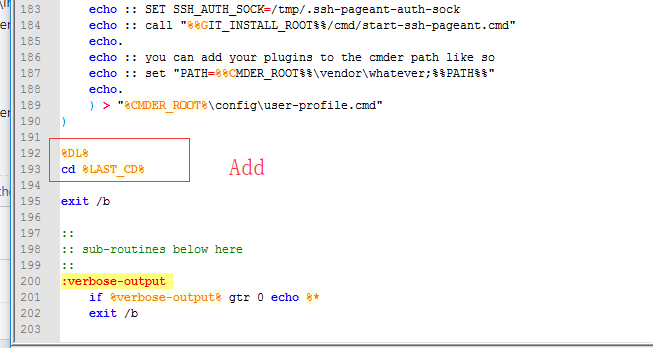 "cmd.exe" /k set ConEmuDir=""%CMDER_ROOT%\vendor\conemu-maximus5&&Call %CMDER_ROOT%\vendor\init.bat""
So I resolved it like this ( notice a pair of " is now around %CMDER_ROOT%. "cmd.exe" /k set ConEmuDir=""%CMDER_ROOT%"\vendor\conemu-maximus5&&Call %CMDER_ROOT%\vendor\init.bat"
Command "cmd.exe" /k "%CMDER_ROOT%\vendor\init.bat" can work. However, when I open terminal, the direction would not locate in my project. (It will locate in C;\user.) Anyone knows? "C:\Windows\System32\cmd.exe" /k set ConEmuDir=""%CMDER_ROOT%\vendor\conemu-maximus5&&Call %CMDER_ROOT%\vendor\init.bat""
Hey, it works but any idea why it always opens not in the project folder because when I open the terminal it works with cmder but it's navigated in my windows user folder and not in my project location. http://prntscr.com/is6i7u help would be much appreciated. If your location of cmder isn't constantly changing, just put the absolute path to where ever you have it located and forget all that environment variable crap. This works perfectly well in Webstorm 2018.1. Note the forward slash /, works for me on Windows 10. @DRSDavidSoft it's a bit different, as this solution includes a CD command in the new .bat file, which makes sure that Cmder starts up in the project directory. Maybe this fix will help to someone, who has issues with PyCharm and virtualenv activation. I tried Ansicon, which works for a regular cmd.exe. cmder (ConEmu), however, blocks it from running. When Ansicon is installed for cmd.exe and PhpStorm is using the recommended "cmd.exe" /K "%CMDER_ROOT%\vendor\init.bat", it just crashes. Running Windows 7. I just really want to use Cmder and still see those colours from Composer, and any other PHP console app for that matter. I don't think it's possible though. Good day! is there a way how to fix this strange output in Phpstorm terminal? I'm using cmder. Side note, if you want to display debug information, for example if you use @debug in sass, you need to enable verbose mode. "cmd.exe" /k set CMDER_ROOT=D:\Program Files\cmder&&set ConEmuDir=%CMDER_ROOT%\vendor\conemu-maximus5&&call "%CMDER_ROOT%\vendor\init.bat"
CALL cmd /c ""%CMDER_ROOT%\vendor\git-for-windows\bin\bash" --login -i"
I assume replacing the last line with the appropriate command from the relevant Task in Cmder (or ConEmu) settings will do the job, but I welcome any corrections! Does anyone know how to use PowerShell Cmder task in JetBrains IDEs? Here is the instruction for VSCode https://github.com/cmderdev/cmder/wiki/Seamless-VS-Code-Integration#use-powershell-instead-of-cmdexe, but I didn't know how to pass this parameters to Rider terminal settings. Just as a heads up, I didn't have to use any hacks, environment variables, etc.... I just pointed the shell path to [cmder path]/vendor/git-for-windows/bin/bash.exe. "cmd.exe" /k "C:\Program Files (x86)\cmder_mini\vendor\init.bat"